The icicles hanging from your roof may look pretty, but they may be a sign of a bigger problem. Icicles can be a sign of ice dams – chunks of ice that form along the edges of your roof. 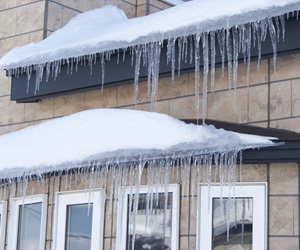 Ice dams typically form when snow melts on your roof, water pools on the edge of the roofline and refreezes. During the freeze, the ice can back up under the roofing material and create ice dams. Ice dams result in water seeping into soffits, walls and even ceilings. Damage goes far beyond cosmetic issues – your home’s structure can suffer from moisture damage and even rot. Having proper insulation levels in your attic will work to keep the heat where it belongs – in your living space. Uncertain if your insulation level is enough? We can help. We typically recommend adding blow-in fiberglass insulation to attics of existing homes to fill open spaces around your current insulation. Proper ventilation is an important part of attic insulation. A qualified insulation contractor will be able to determine if your attic has proper venting, and if not, how that can be corrected to ensure your attic has proper air flow. Even if your home has adequate insulation and proper venting, large amounts of snow and the weight of that snow can result in roof damage. After a large snowfall it’s recommended to rake the snow from your roof to remove some of the weight and allow any water to flow off the roof. Still have questions on how to prevent ice dams in your home? Call us!